Oil: enough energy to melt glaciers! Thanks to Gristmill for pointing to this amazing advertisment from a 1962 issue of Life Magazine. 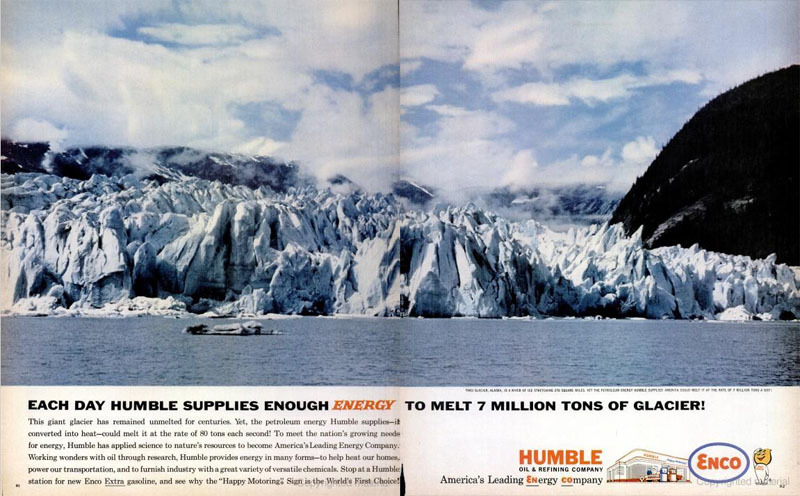 Humble Oil later merged with Standard to become Exxon. Reporting in the journal Nature in September, researchers from British Antarctic Survey and the University of Bristol describe how analysis of millions of NASA satellite measurements from both vast, polar ice sheets shows that the most profound ice loss is a result of glaciers speeding up where they flow into the sea. For an overview of the Arctic, check out the Arctic Report Card, released earlier this month. Columnist David Roberts sees the Copenhagen climate change conference negotiating process so far as akin to "an aquarium full of hamsters connected to rudimentary motors. There's a lot of frantic running, a lot of sweat and heat, but in the end, very little light". The dim light that does exists flickers on a target for Australia and the developed economies of reducing emissions by 2020 to 25% below the level of 1990. In Bali two years ago, the European Union proposed a framework that included global emissions peaking in 10–15 years and for developed countries to achieve emissions levels 20–40% below 1990 levels by 2020. The United States, supported by Australia and others, strongly opposed this. In a flood of tears and acrimony, the final Bali session sat through the night to produce a compromise that mandates "deep cuts in global emissions", with footnote references to the 2007 IPCC report which talks about the developed economies needing to reduce emissions 25 to 40% below 1990 levels to have a reasonable chance of holding warming to 2 degrees Celsius. The Garnaut report quietly dropped the 40% end of the range and mischievously took 25% by 2020 as being a 2-degree target. 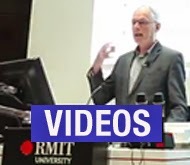 The Rudd government followed in these footsteps and went for a 25% target, with highly conditional qualifications, in the revised CPRS in May, abetted by the ACTU-led Southern Cross Climate Coalition. Now 2 degrees isn't the sort of target anyone with grandkids should aspire to. 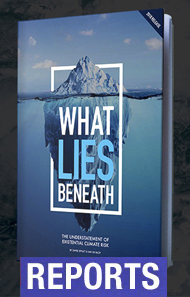 The research tells us that a 2-degree warming will initiate large climate feedbacks on land and in the oceans, on sea-ice and mountain glaciers and on the tundra, taking the Earth well past signiﬁcant tipping points. Likely impacts include large-scale disintegration of the Greenland and West Antarctic ice-sheets; sea- level rises; the extinction of an estimated 15 to 40 per cent of plant and animal species; dangerous ocean acidiﬁcation and widespread drought, desertiﬁcation and malnutrition in Africa, Australia, Mediterranean Europe, and the western USA. You can bet your house that Copenhagen will not conclude with a 25% mandatory target for all the developed economies, but is it what we need to do, or is the whole of the Copenhagen process wrapped in an enormous delusion? In September, researchers from Oxford and Germany's Potsdam Institute, produced figures on a carbon budget to 2050. In essence, they estimated how much carbon in total can be put in the air to 2050 if the aim is to not exceed 2 degrees. 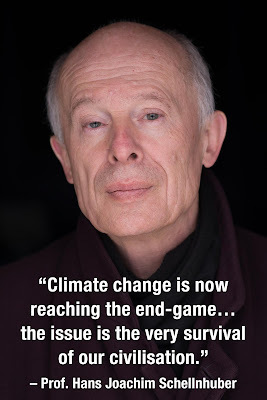 From there it's not too hard to work out what each country needs to do, and that what's the Potsdam Institute Director Professor Hans Joachim Schellnhuber did in his recent presentation to the "4 Degrees and Beyond" conference in Oxford. Assume the present population, and divide it into the total carbon budget and you get a budget per person to 2050. [This is based in the assumption that each citizen of the planet has an equal right to the budget, a proposition disputed by many in the developing world who rightly point to the historic carbon debt on which the developed world built their economies]. Nevertheless, by taking the per capita allocation to 2050 and comparing it to a nation's current annual emissions per person, you get a clear picture of national responsibilities, and that's what Schellnhuber did in a single chart. Australia, like the USA, is top of the pops for per capita emissions. If we maintain that rate, our carbon budget to 2050 runs out in five years. Five years!! 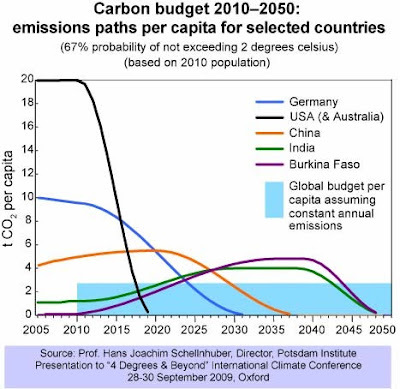 Or put in another way, as the chart illustrates, Australia and the USA would need to be at zero emissions by 2020. Just follow the black line. Not 25% by 2020, but 100% by 2020 for Australia. That's the science, unadorned. God forbid the politics.